Mobile Bingo Bonuses bring you a household name in slots gaming called Avalon II: The Quest for the Grail which is the sequel to the incredibly popular Avalon Slots. The fact that Avalon II is from the top software provider Microgaming means that you know it will be both high quality and impressive. But when you add in dramatic, adventurous and exciting then it was bound to be a gamers favourite. What is Avalon II Slots? The basis of the slots game is the legend of King Arthur and the Knights of the Round Table, with many recognisable symbols such as King Arthur himself, Merlin, Guinevere and of course the Grail. This amazing 5 reel game has 243 pay lines, an RTP (return to player) of 95%, as well as a whopping 8 bonus features. With play from as little as 30p to as much as £7.50 per spin you’ll soon become embroiled in this medieval themed slots game where good strives over evil. The basic wild symbol in this game is the Avalon II symbol, but the Lady of the Lake will assist you in expanding the wild. Both of these symbols will substitute any other symbol, with exception of the Holy Grail. When the Lady of the Lake appears on the middle reel it’s a brilliant site, as she covers all positions and adds more winnings to your pot. The Isle of Avalon Bonus. Each one offering exciting new ways to build up your prize winnings through spins and multipliers. 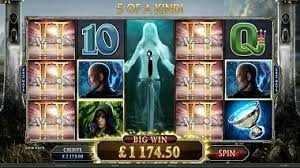 Avalon II is already a huge hit due to its playability and the fact it’s made by the amazing Microgaming, so why not check it out through a great site called Guts Casino. 4th deposit 100% cash match bonus up to £100, plus 25 spins on Starburst. They also offer regular weekly and monthly promotions such as More Money Mondays and Spins Friday, where you can earn more bonus credit to keep the entertainment going. To register and take advantage of the welcome package, simply head to Guts Casino and you’ll find Avalon II on their video slots page.